Would you like your child to learn the fine art of making things with their hands? Maybe your child has expressed an interest in building things on their own? If so, you have come to the right place! Here at The DIY Joint®, we believe that individuals of any age can benefit from our DIY woodworking classes, and children are no exception to that. As such, we are happy to announce that we’ve just launched our first intensive series of woodworking classes for kids, including a 6 week spring semester, and a week-long summer camp! The DIY Kids after-school program consists of 90-minute classes over the course of 6 weeks. Throughout the semester, students will work together to build fun and challenging wood projects using a combination of hand and power tools. Precise measuring and marking tools, saws, sanders, drills, and more will be used to create projects like gumball machines, toolboxes, shelves, stools, and storage chests. Our goal is to infuse your child with confidence and empower them with critical skills to help them succeed, now and in the future. The after school program is lead by Olga Chechina, owner of local a woodworking program brought to grade-schools throughout northern New Jersey, and Priscilla Van Houten, founder and owner of The DIY Joint®. Summer Camp is a week-long immersion for kids between the ages of 9-16 years old. Along the way, students will gain critical woodworking skills including the use of hand and power tools, planing and finishing custom projects, joinery techniques, and more. Students will create a mix of fun and practical projects like kinetic sculptures, chairs, outdoor games, and golf courses. Each day, campers will put their projects to the test during outdoor breaks in the park. Summer camp is lead by Christopher Murphy, a grade-school woodworking teacher with 10 years experience, and Priscilla Van Houten, founder and owner of The DIY Joint®. Why Choose The DIY Joint? Your child’s development is important, and The DIY Joint is proud to offer parents with a one-of-a-kind learning opportunity. Our kids DIY woodworking lessons are specifically designed to encourage creativity and collaboration while teaching your child the ins and outs of basic woodworking techniques, tools, and equipment. 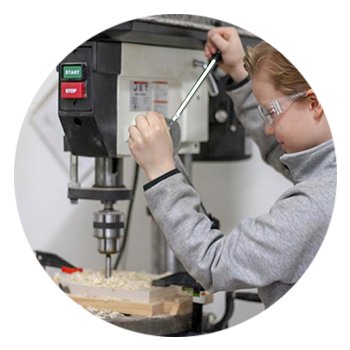 We’ve partnered with local, experienced woodworkers to ensure your child gets the best benefit of our lessons. Whether you are interested in our innovative after-school program or our convenient summer camp, we would love to hear from you! Contact us today with questions, or register your child for classes online now! What are pick up and drop off times for my child? Students may arrive five minutes prior to the scheduled start time and they must be picked up no later than 10 minutes after the end time. Unfortunately, we do not offer extended care beyond these times for our kids woodworking classes. Registration costs for our kids woodworking program and summer camp cover all of the tools and materials your child needs to participate. Two snacks per day will be provided during summer camp only, but your child must bring their own water and lunch. Safety is our number one priority in our woodworking shop. When visiting or working in the Joint, please wear shop-appropriate clothing. Closed-toe shoes and fitted clothing are required. If your child has long hair, please tie it back. Please also have your child remove all loose jewelry and rings before operating tools and equipment. My child has no woodworking experience whatsoever - are they still welcome to attend? Absolutely! Our kids woodworking classes are designed with beginners in mind and they are appropriate for all skill levels. In fact, the majority of our students have never tried a woodworking project, so your child will be in good company! After-school program: Full (100%) refund if canceled at least 21 days in advance of the start date, half (50%) refund for cancellations 14 days in advance of the start date, and no refunds less than 14 days in advance of the start date. Summer camp: Full (100%) refund if canceled before May 1, 2019, half (50%) refund for cancellations after May 1, and no refunds are given after June 15th.